Do you love great coffee and want to grind your specially selected beans to perfection with a grinder that will do an even, consistent grind? This 3E Home manual coffee grinder is ready whether your preferred brewing method is, such as pour over, French press, espresso or Turkish. You can even use this grinder to grind some types of spices if you like. It's intended for coffee but if you'd like to use it as a spice grinder you'll find it useful as well. This grinder has a ceramic burr which is easily adjustable by turning the knob on the top to set your favorite grinding size. Profession structured ceramic body with stainless steel on the top to enhance the look, which added a spot light to your kitchen and helps avoid the static build up you'll find in some of the plastic bodied grinders. An opening/closing door to prevent bean come out. It is slim and lightweight so it's a great travel coffee grinder to pack with your adventures. This is a perfect accessory for any occasion, whether you are a professional coffee drinker want to control the size of your coffee grain to perfection, or an amateur who just want to bring your coffee taste to the next level. With this manual or hand crank coffee grinder will achieve them all. 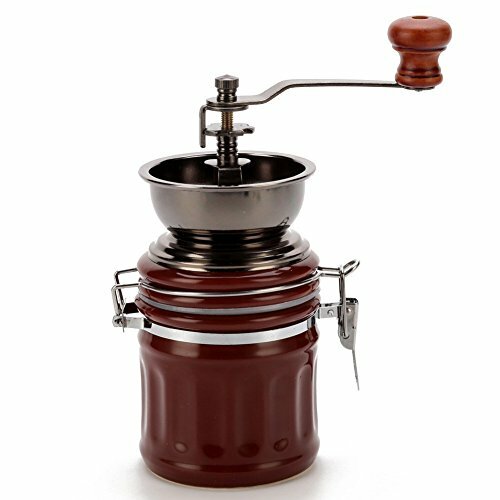 Present this manual or hand crank coffee grinder to someone special or anyone who loves coffee is a wonderful holiday gift and its exquisite look even make an elegant Decor. Dimension of body: 8.07" x 3"
This high quality ceramic burr coffee grinder to ensures a precise and consistent grind every time. This built in adjustable coffee grinder selector gives you control over the coarseness so you define how your Espresso, Pour Over, Cold Brew, French Press or Turkish should be. No batteries or electricity are required to operate this portable grinder, and it is not only allowing you to enjoy fresh ground coffee anywhere, even while camping, but also wouldn't wake your love one while they are asleep. This easy to use hand crank, manual coffee grinder mill reduces noise produced by electric grinders, which means you can enjoy fresh grind coffee while your loved ones are sleeping. If you have any questions about this product by 3e Home, contact us by completing and submitting the form below. If you are looking for a specif part number, please include it with your message.